FlexiSolar has completed a 133kWp solar carport system for a large, multi-storey car park in Sutton, South London. Self-funded by Sutton Council as part of its £500,000 solar PV rollout programme, the project was put to tender under the PfH framework and secured by Campbell & Kennedy, which turned to FlexiSolar for its design. Bespoke frames were designed for the site’s split-level nature and the array covers 57 car parking spaces. Much of the work was conducted overnight in order to limit disruption to surrounding roads. Nearly 500 panels were installed to make up the array and it is expected to generate around 120,000kWh of energy each year. 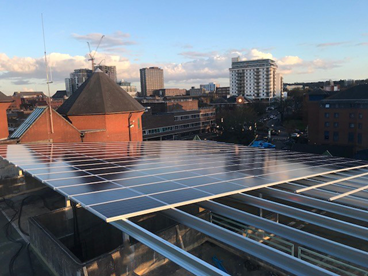 Sutton Council’s solar deployment initiative is one of a number of schemes launched in the council’s bid to become a zero carbon council by 2025. Ian Watts, energy manager at the London Borough of Sutton, said the project was exciting not just because of it is a “financially attractive proposition”, but also because it created a “new landmark” for the borough’s commitment to cutting carbon emissions. “The council is embracing the new digital era and this project is a clear statement of our commitment to adopt new green technologies as part of our daily operation,” he added. Gerry Kennedy, managing director at Campbell & Kennedy said: “The entire team at Campbell & Kennedy are delighted with the results already discernible through the delivery of this contract for Sutton Borough Council. We have amassed a wealth of experience working in close partnership with both private and public bodies in the implementation of energy efficiency projects which result in significant cost savings." This story has been amended to clarify Campbell & Kennedy's roll in the project's development.